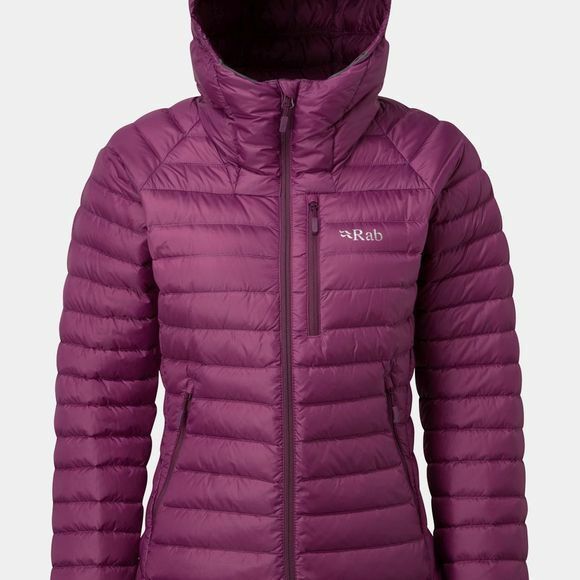 The Womens Microlight Alpine Jacket from Rab is a warm and versatile insulated jacket that will keep you comfortable no matter where your adventure takes you be it from hiking, climbing, to wandering around forest paths. Whatever the task at hand never feel out of place with this insulated down jacket. This outdoor jacket features a Mini-Stitch through baffle construction to retain as much heat as possible on cold winters days. Not only is this jacket warm but also features hydrophobically treated down so that you can stay warm as well as dry no matter the situation. This insulated jacket has all the features you may require from a simple walk through town to a long hike up your favourite mountain climb. Not the down jacket you're looking for? Take a look at our large range of insulated down jackets.